Chelsea midfielder Tariq Uwakwe is thrilled to be fully fit after a spell on the sidelines and hopes to play a part when the young Blues face off with Arsenal in a Premier League 2 clash at Stamford Bridge on Monday evening. The former England U18 international expects a difficult match and is wary of the threat posed by their London neighbors. Uwakwe was not in the Chelsea U23 team that beat Arsenal 5-4 in November 2018, a game in which Faustino Anjorin was on target and five players of Nigerian descent, mostly from the Gunners, made the match day squad. Speaking to the official website of Chelsea, Uwakwe stated : ''It’s been a good few weeks for me personally, getting a lot of 90 minutes after a couple of months out injured, and the team have been doing really well too. ''It’s my first season playing in Premier League 2 and it’s been exciting. I just want to push and finish the season strongly but I think it’s been a good year overall''. 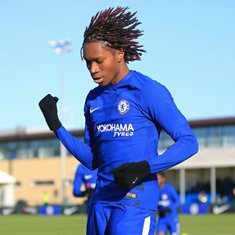 The 19-year-old Uwakwe trained with Chelsea first team in February 2019 ahead of their Premier League match with Tottenham Hotspur.